Let's start off with this. I have read through the Bible. More than once. For a long time, I'd read through the Bible every year. I've read the Bible out loud to my kids more than once. Sometimes, though, I worry that statements like that make me sound super-spiritual and weird. When the truth is, I'm not always ever sure I'm doing this whole thing right. I'm sure this is supposed to impact me more directly than it does, I'm supposed to feel more of a relationship, I'm just supposed to actually become super-spiritual or something. 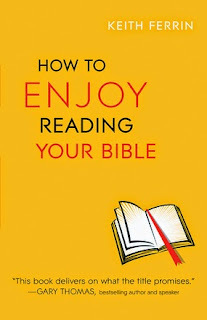 How to Enjoy Reading Your Bible by Keith Ferrin jumped out at me when Bethany House offered it for a May nonfiction review option. I didn't want to review it though. Because I've been trying to cut back on reviews and have a bit more time to process some of the junk going on in my life this year. But it wouldn't let me go. So I signed up. Do you feel like you should read the Bible more? This book will help you want to read it. Keith Ferrin has been talking to churches for years about enjoying God's Word. Here he shares the most helpful ideas and habits you can start using today. You will find ten proven tips that are equally practical whether you are a longtime Bible student or simply exploring what this life-changing book is all about. Aimed at deepening your relationship with God, these simple suggestions will help you focus more easily as you read, remember Scripture better, and most importantly, enjoy the Bible and its Author more than you ever dreamed possible. When the book arrived, I started kicking myself. WHY did I sign up for this? I really don't need someone else making me feel guilty that I'm not doing this Bible-reading thing right. Maybe I could just read the first chapter or two and write a review based on that. But Ferrin sucked me in. He isn't heaping guilt on me. What he is doing is giving ten tips, most of which are really straight-forward and dare I say 'easy' to implement? Okay, well, they aren't all actually easy. I ended the book (yes, I did read it all) feeling encouraged and challenged. I want to jump right in to either his 60-day challenge, or into one of his 4-month challenges. Because those look absolutely phenomenal. That doesn't work, though. You see, my church is doing something starting July 6, where we are committing as a church to reading through the New Testament in eight weeks. So I don't have enough time to do one of Ferrin's challenges before this church one begins, and I know that overlapping them is a bad idea for me. This challenge at church, though, falls oh-so-very in line with the ten tips that Ferrin is giving. I kept thinking in each chapter about how I can use that with my church challenge. Some of it is just going to happen automatically, and it was really exciting to see how this book is preparing me for the church challenge. I do have six weeks, though, before the challenge at church starts. Six weeks where I'll be traveling, and dealing with going through my mom's things, and I'm not sure I want to exactly start a major challenge exactly. Because I had thought about adapting a 60-day challenge to a 42-day one. But that is setting myself up to fail. Instead, I am going to focus on incorporating some of Ferrin's non-challenge tips into the next few weeks, and being really prepared for our New Testament work in July.